Pipe Dreams: Hookah smoking is cool, but is it safe? A look at mainstream hookah smoking. On a recent night out in Tampa, 26-year-old Tara Wasserman and a handful of her friends nestle into a dark, plush booth at her favorite hookah hangout, the Meridian Hookah Lounge. For $12 apiece, Wasserman and her friends can sample a variety of sweet tobaccos, smoked through the water pipe at the center of the booth, and stay until the lounge closes at 3 a.m. The specially cured “shisha” tobaccos come in flavors like guava, strawberry and coconut. Wasserman and friends choose a blend, and servers place a sticky lump of shredded tobacco into a small bowl that’s connected by a stem to the pipe’s water-filled glass base. A piece of foil is placed atop the tobacco, and atop the foil goes a hot coal that heats, but does not ignite, the tobacco. Hoses, each attached to the stem of the hookah, snake across the table. Along with the tobacco, each smoker gets a plastic tip that she attaches to a hose; sucking on the hose pulls air past the coal and creates a sweet-tasting smoke that’s inhaled after it bubbles through the water. The silky smoke gives off a pleasant aroma similar to sweetened incense or potpourri. A centuries-old Indian apparatus that spread to the Middle East, the hookah is a cousin of the water pipes and bongs often used to smoke marijuana. The beginning of the hookah bar trend in Florida appears to date to 1999: When Jason Bajalia opened the Casbah Cafe in Jacksonville’s upscale Avondale neighborhood, he incorporated hookahs and flavored tobaccos into his theme. Today, Florida has dozens of hookah lounges where anyone over 18 can join in the hookah smoking. Most are in larger cities like Tampa, Orlando, Miami and Jacksonville or near college campuses. There are at least eight hookah bars or restaurants in Gainesville near the University of Florida, and at least two in Tallahassee near Florida State. While the typical college student-oriented lounge features plush couches, dim lighting and free wi-fi, a more authentic Middle Eastern hookah experience is available at places like Al-Aqsa in Tampa. Attached to a Middle Eastern grocery, the sparsely decorated cafe attracts a mostly Muslim crowd that gathers under fluorescent lights to play cards or watch TV and smoke. How trendy have hookahs become? The Ritz-Carlton on South Beach hosts a “Hookah Lounge Happy Hour” each Thursday and Friday night at its swanky DiLido Beach Club. 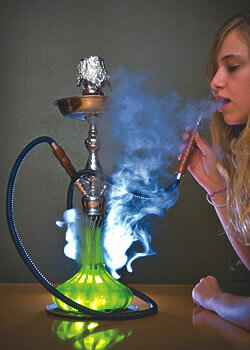 In Fort Lauderdale, the Hookah Express will deliver a hookah directly to your home, condo, pool or beach. The company’s “rent-a-hookah” service includes two bowls of tobacco and costs $20. Aiding the hookah trend is a loophole in the state’s 2003 law than bans indoor smoking. The law defines smoking as “inhaling, exhaling, burning, carrying or possessing any lighted tobacco product.” With hookahs, however, the tobacco is merely heated by the coal — it’s never technically on fire. And so hookah bar operators can serve hookah and chicken kebab side by side, an act that would be illegal if their patrons were smoking cigarettes or cigars instead. Perhaps the biggest factor working in favor of hookahs is their cachet — the perception by fans like Wasserman that smoking flavored tobacco lacks the stigma that cigarettes carry and that the practice of smoking it is a milder experience, and therefore safer, than cigarette smoking. The most recent Florida Youth Tobacco Survey, which tracks smoking among public middle and high school students in Florida, found “alarmingly high” rates of hookah use among Florida adolescents, with rates among high school students approaching figures reported by samples of university students. In 2007, only 9.3% of female high school students and 12.3% of male high school students had ever tried hookah smoking. By 2009, 14.2% of high school girls and 17.3% of high school boys had smoked tobacco through a water pipe at least once. Meanwhile, research indicates hookah smoking is likely every bit as dangerous as cigarettes. Studies, including a 2005 report published in the journal Food and Chemical Toxicology, have found that a single hookah smoking session delivers up to four times the nicotine, 11 times the amount of carbon monoxide and 72 times the tar of a single cigarette. Barnett says the fact that it’s the charcoal that is burning — not the tobacco — only adds to the danger. In fact, she says, the burning charcoal is actually “more harmful” and emits “a lot more carbon monoxide” than the tobacco. “You aren’t allowed to barbecue inside with charcoal because the carbon monoxide rate inside your apartment would just go through the roof. Well, the thing that’s sitting atop all those hookahs is a little piece of charcoal, and the carbon monoxide they’re giving off, including secondary, are really high levels,” says Barnett. While hookah bars have gained wide acceptance in many areas of Florida, some communities and landlords aren’t so welcoming. Bajalia says that when he looked into opening a hookah cafe in St. Augustine several years ago, the city council told him not to bother. “They said, ‘Absolutely not. We’ll shut you down.’ ” In Tampa, some strip malls near the University of South Florida have posted signs stating that smoke shops or smoke lounges need not apply to lease space. Earlier this year, Soloman Wassef encountered significant opposition from the city council when he tried to obtain a beer and wine license for the hookah lounge he planned to open in downtown Lakeland. Even the former mayor showed up at a commission meeting to protest the establishment. While the commission ultimately approved Wassef’s plan to open the Hookah Palace, it was with one caveat: Only those who are 21 years and older can enter. In addition to a backlash from health experts and landlords, hookah bars also face tax issues. Eight years ago, soon after the advent of the hookah craze, the tax rate on tobacco in Florida was 25% of the wholesale price. Today it’s at 85%. 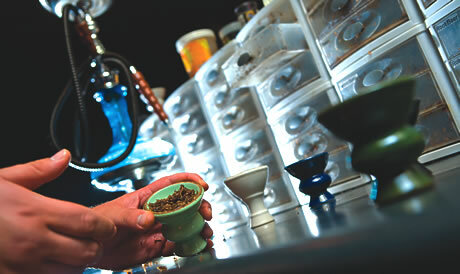 The hookah industry, meanwhile, is keeping a close eye on federal legislation, H.R. 4439, which would raise the tax on hookah tobacco by 775%. The “Tobacco Tax Parity Act of 2010” is intended to bring tax rates on pipe tobacco, which includes hookahs, in line with the higher rates imposed on rolled tobacco. But hookah proprietors say that a 250-gram (8.75 ounce) box of hookah tobacco that currently retails for $5.99 would cost more than $20 if this bill passes, which could put them out of business. Manny Franco, general manager of the Blue Lizard Hookah Lounge near USF in Tampa, says such a tax increase would make it impossible to eke a profit out of the hubble-bubble. If that happens, he says he plans to offer only herbal hookah, a nicotine-free product made from tea leaves. Jason Bajalia, who included hookah smoking when he opened the Casbah Cafe in Jacksonville 11 years ago, says he knew he was on to something when patrons began offering him $400 to $500 to buy hookah pipes he’d purchased from Egypt for just $10. Today, he says, business is still going strong, with between 120 and 130 hookah sessions each day. While 50% of his sales come from food, hookahs and alcohol each make up another 25%.